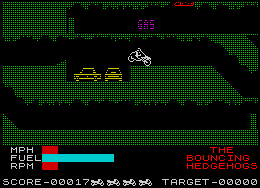 If jumping over double decker buses and manoeuvring around giant hedgehogs is your thing then Wheelie is the game for you. My only gripe about this game is the dodgy SFX and the even dodgier scrolling. I still love it, even after over three decades!